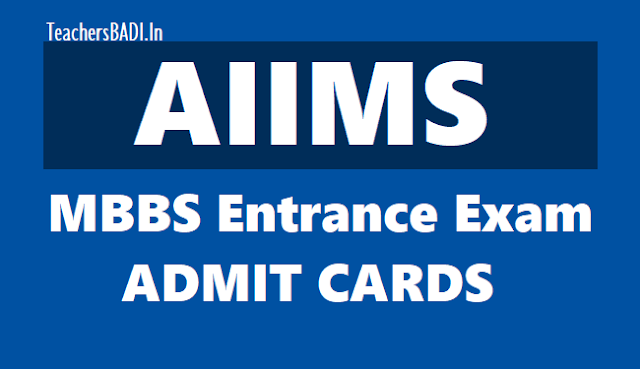 AIIMS MBBS Entrance Exam Admit Cards 2018 to release on May 10 on aiimsexams.org: All India Institute of Medical Sciences, AIIMS New Delhi will release the AIIMS MBBS admit cards on May,10. The admit cards would be available in online mode only on the official website. The steps to download the admit card are provided below with the direct link. The candidates who have registered for the examination would be able to download their admit card from aiimsexam.org. Step 3. Enter all the required data such as Candidate Id, password etc. Step 5. Download the admit card and take a printout for future use.Candidates would require candidate Id and password. Candidates are advised to take two printouts at the examination centre. The candidates will not be able to enter in the examination hall without admit card. The exam will be conducted for three hours and thirty minutes. It will be conducted in two shifts, i.e. Morning Shift, 9:00 AM to 12:30 PM and Afternoon Shift, 3:00 PM to 6:30 PM. AIIMS exam will be conducted in 171 cities across the country. The online application was begun from February 5, 2018, and was ended on March 5, 2018. The admit cards will release on May 10, 2018, and the exam will conduct on May 26 and 27, 2018. The result would be declared on June 18, 2018.